The expert craftsmanship of this beautiful jigsaw puzzle commemorates your home together. 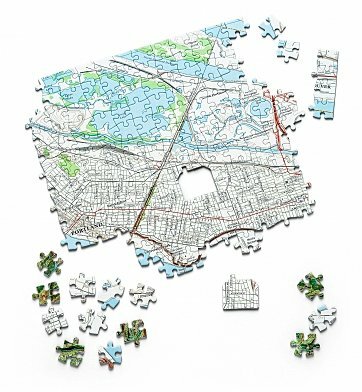 Your address is the home-shaped piece at the center of the map, with the surrounding area a charming jigsaw puzzle that is fun to put together and even more memorable to keep. One 400-piece jigsaw puzzle map of your chosen location. Enter your address information during the personalization phase of the ordering process - the map puzzle will be created around your chosen location. Puzzle measures 18" x 12" when put together. Home is Where the Heart Is Map Puzzle is a hand delivered gift. These gifts are delivered by one of our local design centers located throughout the United States and Canada. Same day delivery is available for most gifts when ordered before the cutoff time. The cutoff time for Home is Where the Heart Is Map Puzzle is in the recipient's time zone. Commemorate your home together or your first home purchase! 400 piece jigsaw puzzle, your address is the center home-shaped piece. Arrives in gift box with complimentary card bearing your personal message.